In Presbyopia, a person’s eye progressively diminishes in its ability to focus on near objects with age. The exact mechanism that causes this “loss” in focusing ability is not completely proven. However, most researchers believe that the crystaline lens inside the eye loses its flexibility with age as an early cataract begins to form. Presbyopia occurs as a patient begins to enter their late 30s or early 40s. It is characterized by an inability to use the muscles inside the eye to move the image from behind the retina onto the retina. This is often corrected with lenses that have a bifocal in them. This loss in flexibility directly causes a loss in person’s ability to focus. Similar to grey hair, presbyopia is a symptom that everyone experiences as they age. The first symptoms most people notice are difficulty reading fine print, particularly in low light conditions, eyestrain when reading for long periods, blur at near or momentarily blurred vision when transitioning between viewing distances. Many extreme presbyopes complain that their arms have become “too short” to hold reading material at a comfortable distance. 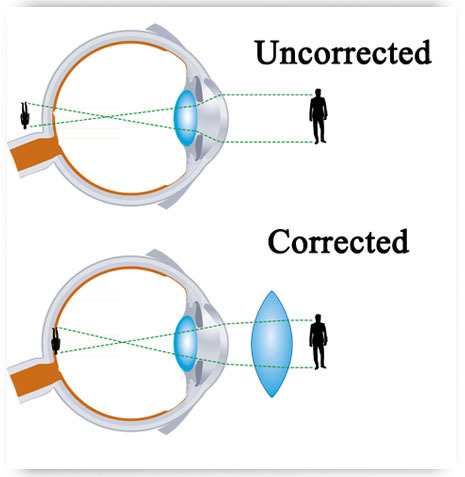 Presbyopia symptoms, like other focus defects, become much less noticeable in bright sunlight due to the action of the iris closing to a smaller diameter. This is a similar effect that occurs with a camera. A small pupil increases the depth of field for the observer and offers some help for the observer. A delayed onset of seeking correction for presbyopia has been found among those with certain professions. For instance homemakers and farmers work in broad lighting conditions and are not stuck on a computer all day, so they tend to seek out help a few years later than engineers and computer programmers who are looking at small print much more frequently. 1. Reading Glasses – Over the counter reading glasses are sold to may people in drug stores, and in dollar stores. They are an effective form of treatment for people who see well in the distance. Of course, these do not work for near sighted individuals, and only work well for far sighted individuals who have small degrees of far sightedness. 2. Contact Lenses – Have you ever seen the president of the United States wearing glasses? The reason why you never see this occurring is because every president of th United States has monovision contact lenses and or bifocal contact lenses. This is a very effective form of treatment that can be tried during a contact lens examination. 3. Bifocal Glasses – This works very well for most people. The top portion of the glasses are for seeing in the distance and the bottom portion of the lenses are for seeing up close. The two main types of bifocal glasses are glasses with and without a line. A progressive addition lens does not have a line. Lots of people prefer the “no line” or progressive lens because it is cosmetically pleasing. However, we prefer the lined bifocal because it is easier for a patient to adapt too. During the routine eye examination, a prescription is always given to the patient, and bifocal glasses are an excellent option for glasses.